Wien, 01.03.1838, Gründeraktie über 500 Gulden, #3432, 25,2 x 39,7 cm, schwarz, beige, Knickfalte mit Einriss, kleine Randeinrisse, Rostspuren, KR ab 1919, OU, ausgestellt auf Herrn Peter Rohrmann und rückseitig von ihm signiert. R8. Vienna, 1 March 1838, Founder's Share of 500 Gulden, #3432, 25.2 x 39.7 cm, black, beige, folds with tears, small tears, rust, coupons for the years 1919 and later, original signatures, issued to and signed on reverse by Peter Rohrmann. R8. 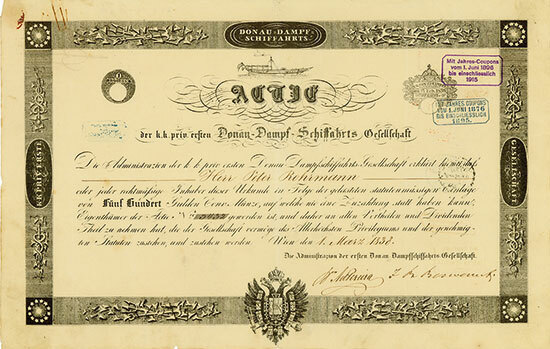 The shipping company (DDSG) was founded in Vienna on 13 March 1829. The steamer “Franz I.” ran between Wien and Budapest in 1830. The company became the largest inland shipping company of the world within the following years. It transported 1.6 million passengers in 1889. The fleet consisted of 200 steamers and 1,000 barge-loads at that time. The company also owned shipyards, a coal mine next to Fünfkirchen and subsidiaries at the Danube. Both World Wars caused large losses for the DDSG. It lost it shipyards, coals mines and large parts of its fleet. The DDSG was under Soviet control during occupation after 1945. The company was privatized in 1991. It was separated into two companies: DDSG-Cargo GmbH (cargo shipping) and DDSG-Donaureisen GmbH (passenger shipping). DDSG-Cargo was sold to Stinnes AG in 1993. Stinnes AG sold the company to Gerhard Meier AG in 1997. And the Serbian-Cypriot company East Point Holding Limited bought the company in 2007. The company then was renamed to Erste Donau-Dampfschifffahrt-Gesellschaft. The DDSG Donaureisen GmbH found no new owner. A large part of the passenger ships was taken over by DDSG Blue Danube Schiffahrt GmbH.